NETA Scientific offers a collection of reliable cooling equipment for sample studies requiring temperature at/or below ambient temperature. 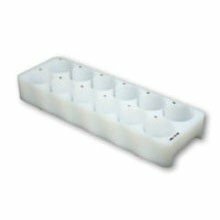 Browse refrigerator and refrigerator accessories, freezer and freezer accessories, ice buckets, and cold traps best for biopharmaceutical, biotechnology, and life sciences research and development laboratories. We supply dry ice machines, dewar vessel accessories, and ice carriers from industry-leading brands.